Coal is a nonrenewable energy source because it takes millions of years to create. The energy in coal comes from the energy stored by plants that lived hundreds of millions of years ago, when the earth was partly covered with swampy forests. For millions of years, a layer of dead plants at the bottom of the swamps was covered by layers of water and dirt, trapping the energy of the dead plants. The heat and pressure from the top layers helped the plant remains turn into what we today call coal. 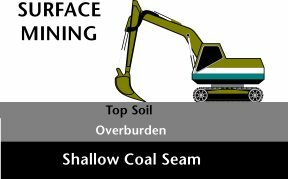 Underground mining, sometimes called deep mining, is used when the coal is buried several hundred feet below the surface. Some underground mines are 1,000 feet deep. To remove coal in these underground mines, miners ride elevators down deep mine shafts where they run machines that dig out the coal. Read about a visit to a real underground coal mine. Most coal is transported by train, but coal can also be transported by barge, ship, truck, and even pipeline. About 68 percent of coal in the U.S. is transported, for at least part of its trip to market, by train. It is cheaper to transport coal on river barges, but barges cannot take coal everywhere that it needs to go. If the coal will be used near the coal mine, it can be moved by trucks and conveyors. Coal can also be crushed, mixed with water, and sent through a "slurry" pipeline. Sometimes, coal-fired electric power plants are built near coal mines to lower transportation costs. Coal is classified into four main types, or ranks (lignite, subbituminous, bituminous, anthracite), depending on the amounts and types of carbon it contains and on the amount of heat energy it can produce. The rank of a deposit of coal depends on the pressure and heat acting on the plant debris as it sank deeper and deeper over millions of years. For the most part, the higher ranks of coal contain more heat-producing energy. Lignite is the lowest rank of coal with the lowest energy content. Lignite coal deposits tend to be relatively young coal deposits that were not subjected to extreme heat or pressure. Lignite is crumbly and has high moisture content. There are 20 lignite mines in the United States, producing about seven percent of U.S. coal. Most lignite is mined in Texas and North Dakota. Lignite is mainly burned at power plants to generate electricity. Subbituminous coal has a higher heating value than lignite. Subbituminous coal typically contains 35-45 percent carbon, compared to 25-35 percent for lignite. Most subbituminous coal in the U.S. is at least 100 million years old. About 44 percent of the coal produced in the United States is subbituminous. Wyoming is the leading source of subbituminous coal. Bituminous coal contains 45-86 percent carbon, and has two to three times the heating value of lignite. Bituminous coal was formed under high heat and pressure. Bituminous coal in the United States is between 100 to 300 million years old. It is the most abundant rank of coal found in the United States, accounting for about half of U.S. coal production. Bituminous coal is used to generate electricity and is an important fuel and raw material for the steel and iron industries. West Virginia, Kentucky, and Pennsylvania are the largest producers of bituminous coal. Anthracite contains 86-97 percent carbon, and has a heating value slightly lower than bituminous coal. It is very rare in the United States, accounting for less than one-half of a percent of the coal mined in the U.S. All of the anthracite mines in the United States are located in northeastern Pennsylvania. Coal reserves are beds of coal still in the ground waiting to be mined. The United States has the world's largest known coal reserves, about 263.8 billion short tons. This is enough coal to last approximately 225 years at today's level of use. Coal production is the amount of coal that is mined and sent to market. In 2006, the amount of coal produced at U.S. coal mines reached an all time high of 1,162.5 million short tons. Coal is mined in 27 states. Wyoming mines the most coal, followed by West Virginia, Kentucky, Pennsylvania, and Texas.Coal is mainly found in three large regions, the Appalachian Coal Region, the Interior Coal Region, and Western Coal Region (includes the Powder River Basin). More than one-third of the coal produced in the U.S. is produced in the Appalachian Coal Region. West Virginia is the largest coal-producing state in the region, and the second largest coal-producing state in the U.S.
Large underground mines and small surface mines. Coal mined in the Appalachian coal region is primarily used for steam generation for electricity, metal production, and for export. Texas is the largest coal producer in the Interior Coal Region, accounting for almost one-third of the region�s coal production. Over half of the coal produced in the U.S. is produced in the Western Coal Region. Wyoming is the largest regional coal producer, as well as the largest coal-producing state in the nation. Some of the largest coal mines in the world. Coal is used to generate almost half of all electricity produced in the United States. Besides electric utility companies, industries and businesses with their own power plants use coal to generate electricity. Power plants burn coal to make steam. The steam turns turbines which generate electricity. A variety of industries use coal's heat and by-products. Separated ingredients of coal (such as methanol and ethylene) are used in making plastics, tar, synthetic fibers, fertilizers, and medicines. The concrete and paper industries also burn large amounts of coal. Coal is baked in hot furnaces to make coke, which is used to smelt iron ore into iron needed for making steel. It is the very high temperatures created from the use of coke that gives steel the strength and flexibility for products such as bridges, buildings, and automobiles. In 2006, 49.6 million short tons, or about four percent of the coal mined, was exported to other countries from the United States. Coal is exported to many different countries, but most trade is with Canada, Brazil, the Netherlands, and Italy. More than half of coal exports are used for making steel. Coal exports have been generally shrinking in the past 10 years, while the amount of coal imported from other countries has been growing. In 2006, about 36.2 million short tons of coal were imported from other countries. Most of these imports (from Colombia, Venezuela, and Indonesia) were shipped to electric power producers along the U.S. coastlines. Read about a visit to a coal export facility. Environmental laws and modern technologies have greatly reduced coal's impact on the environment. Without proper care, mining can destroy land and pollute water. Today, restoring the land damaged by surface mining is an important part of the mining process. Because mining activities often come into contact with water resources, coal producers must also go to great efforts to prevent damage to ground and surface waters. When coal is burned as fuel, it gives off carbon dioxide, the main greenhouse gas that is linked with global warming. Burning coal also produces emissions, such as sulfur, nitrogen oxide (NOx), and mercury, that can pollute the air and water. Sulfur mixes with oxygen to form sulfur dioxide (SO2), a chemical that can affect trees and water when it combines with moisture to produce acid rain. Emissions of nitrogen oxide help create smog, and also contribute to acid rain. Mercury that is released into the air eventually settles in water. The mercury in the water can build up in fish and shellfish, and can be harmful to animals and people who eat them. The Clean Air Act and the Clean Water Act require industries to reduce pollutants released into the air and the water. The coal industry has found several ways to reduce sulfur, nitrogen oxides, and other impurities from coal. They have found more effective ways of cleaning coal before it leaves the mine, and coal companies look for low-sulfur coal to mine. Power plants use "scrubbers" to clean sulfur from the smoke before it leaves their smokestacks. In addition, industry and government have cooperated to develop "clean coal technologies" that either remove sulfur and nitrogen oxides from coal, or convert coal to a gas or liquid fuel. The scrubbers and NOx removal equipment are also able to reduce mercury emissions from some types of coal. Scientists are working on new ways to reduce mercury emissions from coal-burning power plants, since the Environmental Protection Agency (EPA) has set tighter mercury limits for the future. 2. Which statement is not true about coal? 3. Coal is classified into four main types, or ranks (lignite, subbituminous, bituminous, anthracite) depending on the amounts and types of carbon it contains and on the amount of heat energy it can produce. Wich type of coal ranks the highest in heating value? 5. What country has the worlds largest reserves in coal?